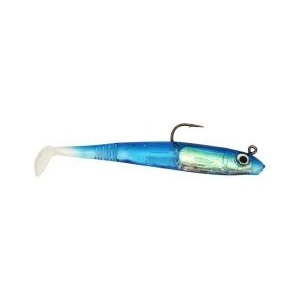 Snowbee's new Stinger Skad Lure is a hybrid of Sandeel and Shad patterns, designed to address the limitations of the two to create the perfect lure, heavier set than the Sandeel patterns, but not as heavy as the Shads. In this way, it cunningly imitates both and will fish effectively, when fish are feeding on either Sandeel, or small baitfish, such as Pout, Mackerel or Herring. The lifelike action of the Skad, is the result of years of research and testing, to create the perfect lure. This new material is also unique, in that it is crystal clear, unlike many of Snowbee's competitors, whose lures use an opaque material. The advantage of this clarity is a clear light reflection, off the outer surface, coupled with an enticing holographic shimmer, off the internal lead-weight foil wrap – a combination which any predatory fish finds irresistible. Available in two sizes and a range of 8 amazing colours, the Skad can be fished on a traditional long flowing trace and boom, over reef or wrecks, for species such as Pollack, Cod and Ling, or used as a casting lure for inshore species such as Bass, Pollack, Mackerel etc. Not yet tried appear ok for the price.